The appearance is white or off-white and their handicrafts are odorless and tasteless fibrous, granular or powder forms. All the cellulose ethers can be made into granules and powders except low-substituted hydroxypropyl cellulose. The moisture absorption rate of cellulose ethers varies greatly with the differences of the appearance. The finer the appearance particles are and the greater the specific surface area is, the faster the moisture absorption rate will be, but it will finally reach an equilibrium value. Meanwhile, it also slightly varies with the size of molecular weight. With the increase of air humidity, the moisture absorption rate will significantly speed up and the equilibrium moisture content will also significantly increase. Celluloses have general thermal decomposition properties, that is, above 200℃, the decomposition rate will accelerate with increasing temperature. In air they can be completely decomposed up to 520℃ while in nitrogen they can reach equilibrium decomposition at the temperature of 500℃. Cellulose ethers are sensitive to microorganisms that produce cellulases. Enzymes first attack unsubstituted anhydroglucose units, resulting in hydrolyzable strand break and then the decrease of viscosity, the substitution of celluloses will protect the skeleton of celluloses. Consequently, cellulose ethers will become stable due to the increase of DS (degree of substitution) and the improvement of substitution uniformity. Due to the increase of DS and substitution uniformity, almost no unsubstituted anhydroglucose units are exposed and get hydrolysis of enzymes. 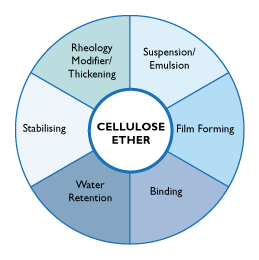 Cellulose ethers are very stable, protected from air, resistant to moisture, sunlight, moderate temperature, usual pollutants. The solid cellulose ethers remain stable at the temperature of 80～100℃, and at higher temperatures and heated for long term they will lead to cross-linking and then form insoluble network structure. Within the temperature range of 130～150℃, the solid products will slightly get degraded. When the temperature exceeds 160 ℃ to 200 ℃, strong degradation will occur and the color will get dark according to the type and heating conditions of ethers. For example, when neutral aqueous solution is heated for a period of time and then cooled to room temperature, its viscosity will remain unchanged, that is, the gel or cohesion occurring in the middle of heating process won’t affect the viscosity.